Winters are difficult for Canadians ( except for those crazy Winter Cyclists), but what of Canada's hard working industrious creatures? We checked in with Edmonton's Favorite ( and unsuccessful mayoral Candidate) Mr. Magpie ( aka @yegmagpie on the Twitter). 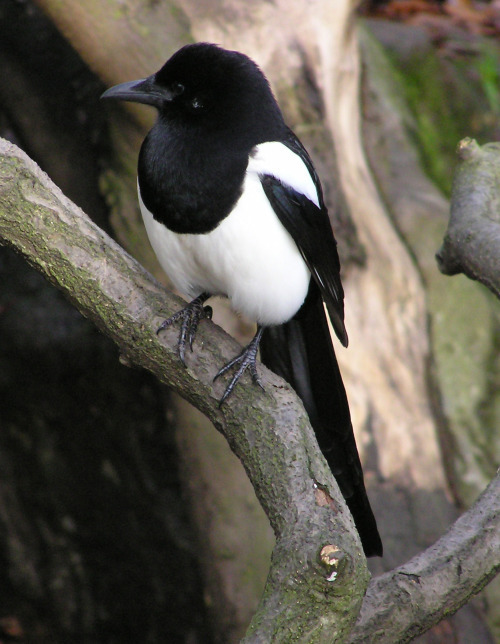 Long John Index: So most of the other birds flew south for the winter months ago, yet the Magpies are still here. What gives? Magpie: A kekcellent question! We magpies evolved up here, so we stay year round! There's less competition from those stupid chirpy songbirds (I'M SHAKING MY FIST AT YOU, YELLOW RUMPED WARBLERS) and there's still plenty of food around. For instance, just this morning I found half a Boston Cream donut outside my local Timmy's! LGI: Do magpies grow extra feathers to cope with the cold, like Dogs grow extra fur? Magpe: No, that's a commonly held myth, but we do sometimes buy a slightly heavier tuxedo in the fall. I myself purchased a nice lightweight merino tux in October from my favorite magpie menswear shop, and it's been holding up reasonably well even in very cold temperatures provided I use The Power of the Floof. Some of us, you may have noticed, also re-purpose winter clothing to cope with killing cold temperatures. I have a Cool Ranch Doritos bag I use as a thermal blanket on coldish days, and if it gets really bad, I have a couple of mittens I use as ponchos. They are stylish, warm, and sometimes cause humans to walk into walls while they stare at me. LGI: How do the cold temperatures, and reduced sunlight effect day to day Magpie activies and or duties? Magpie: Kek! Pretty much the same as humans! We feel lethargic and sleepy, if there's a apatch of sun we bask to heat up our extremely handsome black feathers, we complain constantly about the lack of Vitamin D, nobody wants to go out (even for dumpster raids! ), and we spend a lot of time floofed up to the eyeballs watching Netflix and muttering "When is spring coming?" For those of us with jobs (about 5% of the magpie population) it's also very common to find us huddled up next to the office Tassimo. I myself often have to be forcibly removed by our office admin lady (we have a special oven mitt that she uses for the task). LGI: It’s fairly common to see a Magpie take a bath in a puddle during the summer months, but since there are no puddles in winter, does this mean you guys don’t shower for 7 months? Magpie: Far from it! We are fastidious creatures, like all animals that look vaguely like James Bond, and we often take 'dust baths' in granular snow. You gotta keep your feathers clean and in good condition, otherwise floofing is of little help and we freeze tragically to death, causing little kids to come across our corpses and say "Mommy, is that a dead penguin?" which causes lifelong trauma and years of therapy. Incidentally, is that an oatmeal cookie? Are you going to eat that whole thing? LGI: What are two things Humans can do to help Magpies over the winter? Magpie: Good gosh, I'm glad you asked! Kek! 2. Leave out yarn or string or hairbrush pickings or dryer lint so we can line our nests! Some birds, they don't add to their nests after they finish them in the spring, but we corvids often grab stuff like dried leaves (which are CRAP and often full of FEATHER LICE) to insulate our houses! See, the problem is, we can't buy stuff with a good R-rating cos we often get kicked out of home improvement stores; I know I've been forcibly booted from all the major chains in the city for NO REASON (not for trying to steal screws and washers, AS THEY HAVE UNFAIRLY SUGGESTED).